Once again we will see our tax dollars at work when the Blue Angels arrive for 4 days of noise ! show and annual budget of $30 MILLION. Plus the cost of the delay with vehicles and pollution of the cars parked on the bridge for an hour or more each day. Further, I wonder how many kids will be inspired to be pilots or be aeronautical engineers . Let’s not forget the animals who are frightened or may run away. Well, Monster and whatever your other blog monicker is, no one will be moving due to the Blue Angels 4 day noise and traffic disruptions on the bridges. I was incorrect in stating the DOD/Navy Budget for them was $30 million, instead , it is reported at $40 million per year, aside from the aformentioned traffic disruptions and pollution.This does not include the cost of all the accidents and lives lost since 1946. I am also glad to see the DOD is considering canceling this boondoggle or curtailing it. It is relevant to Beacon Hill, as they do the low flyovers ,and it is your tax dollars at work from the funding provided by congressional appropriations to the Department of Defense. PS: Keep an eye on your pets during these 4 days too. Thank you Lenny for the information of cost both in dollars, lives and disruption. I have often wondered what the cost is for this disgusting display and waste of resources. During a time when we have US soldiers and veterans who often struggle to get basic health and mental health resources, when the cost of gas is so high and we are already polluting with the boats for Seafair activities, I find the Blue Angles an utterly disgusting display of waste. The terror they wreak on our animals and I am sure infants and elderly are completly unneccesary! Oh Right and they fly RIGHT over the Vetrans Hospital. I would love to organize to support the end of this activity. I would not miss anything if I never saw them fly again. 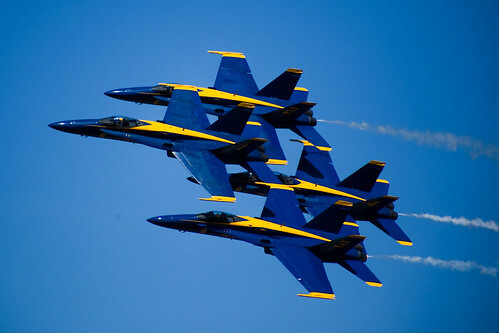 I want to vote the Blue Angels away. Can we could obtain signatures for a petition for a vote to have the Blue Angels peacefully grounded in the Boeing museum? I love the Blue Angels. My cat gets a little spooked but she’s okay after some treats.